If you have been to any restaurant these past few days I am sure you must have been amazed by the technology in place. The digital menus will have you impulsively ordering for food you had not budgeted for. The screen is constantly showing beautiful pictures of appetizers thatyou didn't even know you wanted. The best part is that you do not even have to wait for any wait staff to come by since you can order right there from the tablet! Traditionally, when ordering, the guest needs to wait for the wait staff to get to their table. With these kiosks, you elimnate the wait time and you elminate the need for extra staff to attend so many tables. Your restaurant can run on a more lean payroll which will save the business money. With each passing day, new foods are discovered especially with the current weight obsessed world where everyone wants to consume food with fewer calories. Restaurant owners therefore have to adopt these new foods and they have to be included in the menu. For paper menus one has to re-print them to adopt the change which is costly but with digital tablets, the menu can be updated at a moment’s notice online from anywhere and very fast. 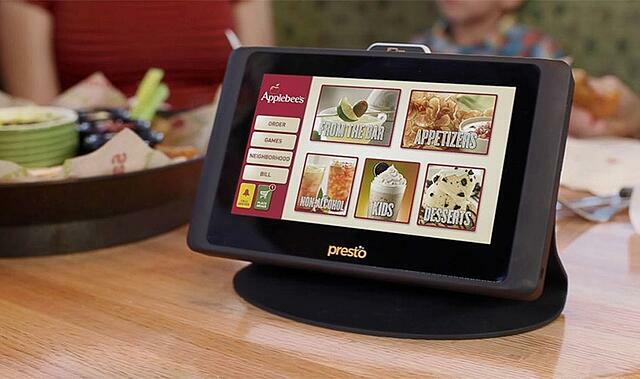 One of the reason's Applebee's implemented their digital kiosks was to give guests access to more methods of payments. A huge benefit of having these kiosks is that guests can pay instantly and never have to wait for the waitstaff to bring them a check or to process the payment. Essentially the customer has compelte control over when and how they pay. Digital menus offer the opportunity to capture survey responses on customer satisfaction. Right after paying, you can give the customers a chance to fill out a quick survey. This will help to see what your restaurant is excelling at and what areas need work. Your faithful employees will not be happy about the addition of these digital kiosks. Essentially it is replacing a lot of their duties as a waitor or waitress. The tablets are really costly and for a big restaurant with many tables and each table requires a tablet, this means an increased expense of purchasing. Theoretically, you can run with less waitstaff so the expense could balance out in the long run. But you will need a team to keep them updated with the most current menu and promotions. The tablets have a daily lkife span. then they have to be plugged in to power back up. This is just one more step needed to be worked out with operations. As time goes on, jsut lik with a cell phone, the battery is not going to last as long which will cause problems for the guest's experience. The advantages of digital menus far outweigh the disadvantages, it is therefore a viable idea for restaurants that are looking to really grow their business to use the digital tablet kiosks.